I just updated this morning, straight to my phone (on WiFi). Liking it thus far, definitely good to have pull down access to stuff from the lock screen. Doesn't seem to work on my Lumia 920, help please? I've had a gazillion apps wanting to update for "Compatibility for iOS7"
Yeah, started it at 5.45 on my way to squash, when I finished at 7 it still wasn't done. There were issues with it validating I think, it had an error saying couldn't verify or something. Took about 5 tries for it to validate it, then 5 minutes to install. yeah took me 45mins using the computer as i had beta and wouldnt let me update over wi-fi. 1.24gb file 20min download but vaildating can take a while as apple servers are getting smashed. Have had it since beta 1 and been loving it! when i go into Software Update, it says "iOS 6.1.3 Your software is up to date"
Yeah, weird, my bro couldn't get it either. just gone back in and it's come up. going to try now. I'd have thought you'd be used to things not working on that phone by now. HEYO! Updating girlfriends phone now, see what is what. In somewhat related discussion, how hard is it to replace a iPhone 4 screen? Accidentally dropped her phone on the floor and it broke but didn't shatter so still somewhat usable. Was quoted $80 from one of those small phone case stores at Indro shops but checked Ebay and the kits are ~$35 so wondering if I can just do it myself. Does this update give the phones the ability for drop and drag from your PC and more freedom? It's a good update, the Airdrop works well. I still hear people moaning about the lack of NFC. Apple would have put it in by now if they wanted it in. They are following a different path which is bluetooth/wifi for phone communication and Airdrop demonstrates this. Hmm, got an unknown update error (6), caused the phone to go into recovery mode. Good ol' Apple! But no Air Drop for earlier versions of iPad. I've got an iPad 2 but it's only for retina display and newer. GRD3 is coming very soon. And no I dont know what GRD3 stands for except windows phone update. I have the latest ipad, does that get it or just phones? I updated my iPhone 4 this morning, loving iOS7. Not a fan of folder structuring with only 3x3 layout and not 4x4 means more scrolling and time wasting. I like how you can access music player even when phone is locked, also a fan of sliding upwards to get into settings. Notes is syncing with exchange too, I don't think it used to do that? 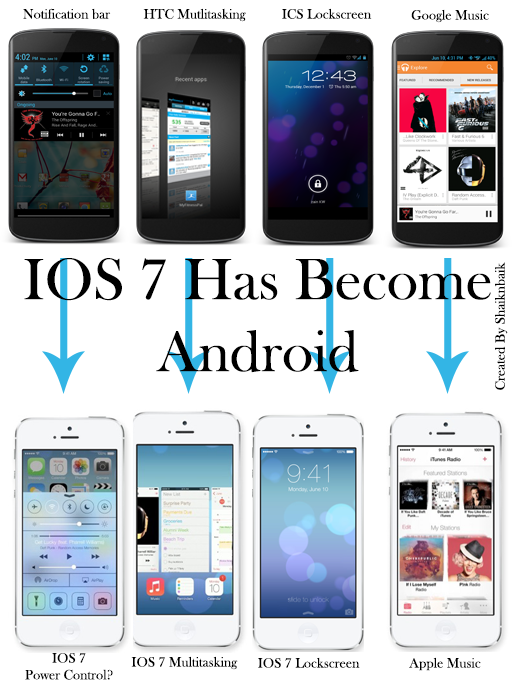 I'm an Apple fan, and I like the new features iOS7 brings. But the graphical style just doesn't look like it's going to hold up well. I think years later I will look back on it like a mullet or a tie die shirt. My phones just hangs/hunting for wether theres an up date. Nah, definitely didn't, I use to have to get people to install an app called iMExchange2 to get that functionality though the app was a little buggy. I like the up swipe and the amount of features accessible from there. Also liking Safari. Getting used to the grey background on the app folders. Also like the flow between open apps when you double tap the home button. I lol'd, my housemate would be the sorta guy who'd get firey about this sorta statement. I'd call him to tell him about it, but his phone would reject my call (or simply not receive any SMS I'd sent). He's usin a HTC one and by his own admission 'my handset problems are a result of the 'daily' type builds I'm using. (as far as I'm concerned, running unstable-as-f*** daily builds at the expense of your handsets reliability, regardless of your choice in the matter, still just makes your handset a POS in the grand scheme of things). Eorl, There's a place in the ACT that handles iphone repairs and does a complete screen and digitiser replacement for $100-120. Whilst there's a little expense there, if its a recent handset, the 'guarantee' that it'll work gives me peace of mind. This place is similar, but is listed in Hobart. There's a known issue with sending SMS if you've been a previous iPhone user using iMessage and have changed platforms, kept the same number, but not deregistered off the iMessage system. Just upgraded my 4s. This will take a bit of getting use to, things feel kind of cramped which i would imagine won't be so much an issue on a 5/5s/5c given there's a bit more screen real estate. nope, me and my brother have always been on android. Just saw this on a mates phone. It looks like my Galaxy S3 OS but you don't have the freedoms or functionality of an android phone still. Good thing the whole world isn't using the one s***** phone or we'd be f***ed. Yeah alot of features my android has already, Apple just seem to be chasing the crowd lately has their lack of innovation died with Jobs? I'll update my wifes iPhone 4 to ios7 when we land back in the country and have a play around with it, her contract ends at the end of the month she is tossing up between the new iPhone 5S or the HTC One/Mini so I guess she might like the new ios since it have the same functions just the lack of freedom. So, AirDrop is incompatible between iOS7 and OS X. Is OS X still the latest mac OS? NFC is an actual ISO/IEC standard, I can see why Apple wouldn't use it. The only reason they're using the stock as a rock 2.4Ghz wifi and not something proprietary is simply because wifi got there first. Is OS X still the latest mac OS? OS X Is like, the general name of the OS since Apple moved to a Unix based OS 10+ years ago. As in OS 10 the successor to Mac OS 9. 10.8 Mountain Lion is the current version with 10.9 Mavericks out at the end of the month. It's pretty crazy they wouldn't try and get them working together. still cant get this update to detect over wifi. That will turn his computer into a 3770S @ 3.8Ghz , 4gb DDR2, 80GB Vertex 3, SLI GTS550s.